Mickey Mantle, one of the most popular baseball players in history, said "It was all I lived for, to play baseball." Sister Jane Marie Lamb, O.S.F. said "I could never have begun to imagine the blessings and joys my life would bring." Both people responded to their calling and have made a difference through their work. Ironically, their grandfathers were brothers. At the end of her freshmen year as an aspirant, Jane Marie Lamb made a big decision. "I told the teaching order that I would not return and that I would enter the Hospital Sisters’ Community after high school," she stated. And that is exactly what she did. She first learned of the Hospital Sisters of St. Francis through her older sister, Sister Mary Evelyn Lamb, O.S.F. She had already entered the Community and when Jane Marie visited, she knew that this was where she was being called. "I was touched by their spirit, joy and simplicity," Sister Jane Marie said. "It was clear that I was being called to the Hospital Sisters, and I had no expectation beyond being a Franciscan," she added. She is the tenth child in a family of twelve children. Her closest sister in age, Sister Jamesine Lamb, O.S.F. is 13 months older and also a Hospital Sister of St. Francis. They were always together. "We started the first grade in the same one-room rural school that our grandfather and father had attended," Sister Jane Marie explained. They then went through grade school and high school together and later worked for the state of Missouri for one year. On September 8, 1954, Sister Jane Marie entered the Community but unlike having her sister with her, she did this on her own. "It was hard that Jamesine did not enter with me, but I knew I needed to respond to my call to dedicate my life to God," she explained. "My parents were prayerful and deeply Christian, and they gave me strength to respond to my call," she stated. At that time, she did not have an interest in being a nurse and expected she would have housekeeping responsibilities for the rest of her life. But she soon found the interest in nursing and she "quickly recognized the joy of reaching out to the sick and the poor of the world." "I was especially eager to work with parents and children where I could share in their joy and bring comfort and healing through the difficult times," she said. She graduated from St. John’s School of Nursing in 1961 and went to Sacred Heart Hospital (Eau Claire) as a staff nurse in maternity. She later received a Bachelor’s Degree in Nursing from St. Louis University and a Master’s Degree in Health Ministry from Sangamon State University. Her love of maternity and pediatrics was evident through her work at St. Mary’s Hospital (Decatur), St. John’s Hospital (Springfield), and St. Francis Hospital (Litchfield). But this was only the beginning of something greater. Through her experience of working with AMEND (Aiding Mothers and Fathers Experiencing Neonatal Death), in 1977, she founded SHARE (Source of Help And Resolving Experiences) as an expression of her love for maternity and pediatrics. "The word SHARE seemed to be symbolic of what we did and we liked the concept of sharing their grief, since so many people are isolated in their grief," she explained. 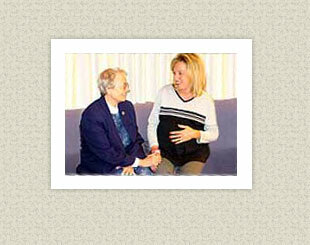 She has journeyed nationally and internationally to minister to parents who have experienced the death of their baby. "It was rewarding to know that I could make a difference in the lives of many parents and caregivers through those ministries," she explained. "My sensitivity to grieving persons began with my parents when we as a family experienced the drowning death of my 18 year old sister, Earline," she added. "Through that sensitivity, I was able to reach out to people," she concluded. To read more about SHARE, please click on this link. Over the years, she has experienced numerous changes. "These changes were in significant areas, such as a growing opportunity to develop my spiritual life, the freedom to discuss options and to ask for studies that would benefit me professionally, an opportunity for spiritual direction, for meaningful retreats and to be involved in developing ministries to which I felt called," she explained. Following Vatican II, there were many opportunities that opened up for her in ministry and in her own spiritual life. It was a time that she deepened her roots as a Hospital Sister and her understanding of her life as a Franciscan. She was given preparation to accompany others on their spiritual journey as a Spiritual Director and was privileged to work with the youth as they made the same spiritual exploration. "I am most grateful for the graces that came to me when I needed insights and courage to do what I was being called to in one of the many ministries," she said. "My classmates were a blessing as they challenged me, they enriched my life and we shared our time and struggles together," she added. "I was given many opportunities for my own spiritual growth and the blessing of sharing in the lives of others," she said. Her work has included serving at the Motherhouse as the Lay Associate Coordinator, Provincial Councilor, and Vocation Directress. She also worked in Pastoral Care at St. Mary’s Hospital (Decatur), Relief Nurse at St. Monica’s (Springfield), and parish ministry at St. Agnes (Hillsboro). She currently volunteers at St. John’s Hospital Carol Jo Vecchie Center for Women and Children that again reaffirms her love of this ministry. Her parents were proud that three of their daughters had responded to the call. "I am grateful for the leadership who believed in me and encouraged me and have been blessed with many prayerful people as they journeyed with me along the way and challenged me to be the best person I could be," she added. "I am forever grateful," she concluded.